In this Jan. 2, 2018 file photo provided by Goodtime Home 1, Kane Tanaka flashes a peace sign during her 115th birthday celebration at her nursing home in Fukuoka, southwestern Japan. A 116-year-old Japanese woman who loves playing the board game Othello was honored Saturday as the world's oldest living person by Guinness World Records. The global authority on records officially recognized Kane Tanaka in a ceremony at the nursing home where she lives in Fukuoka, in Japan's southwest. Her family and the mayor were present to celebrate. The previous oldest living person was another Japanese woman, Chiyo Miyako, who died in July at age 117. 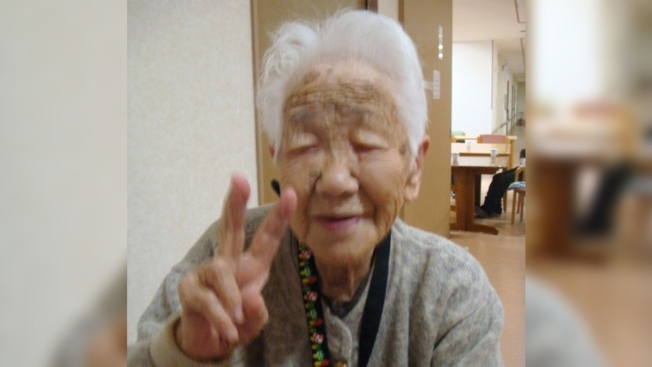 The oldest person prior to Miyako was also Japanese. Japanese tend to exhibit longevity and dominate the oldest-person list. Although changing dietary habits mean obesity has been rising, it's still relatively rare in a nation whose culinary tradition focuses on fish, rice, vegetables and other food low in fat. Age is also traditionally respected here, meaning people stay active and feel useful into their 80s and beyond. Guinness said the world's oldest man is still under investigation after the man who had the honors, Masazo Nonaka, living on the Japanese northernmost island of Hokkaido, died in January at 113.